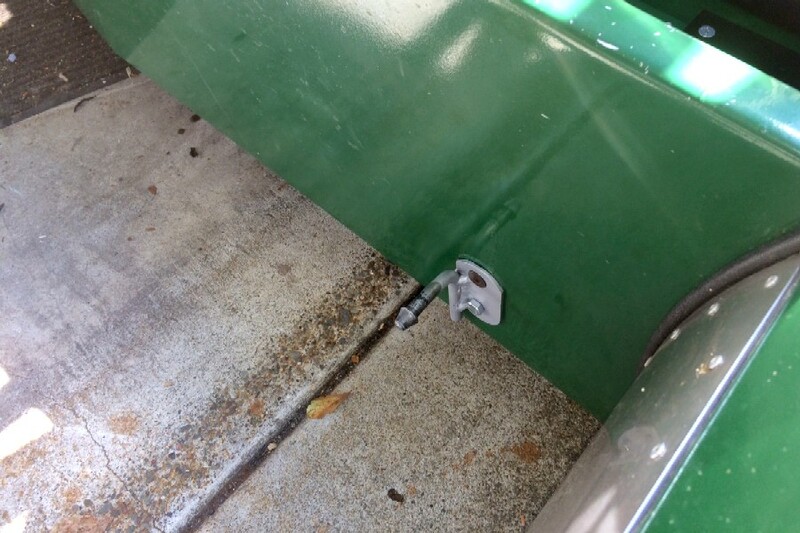 Once again, a blog post extolling the wonderful reliability of our M.G. Locost has precipitated a major breakdown. Well, maybe not major, but certainly debilitating and embarrassing. We were out on a nice drive with the North Bay British Car Club when the exhaust hanger let go. As we've reported in the past, our exhaust hanger is not an engineering marvel, and the rubber mount used in the hanger has a life expectancy of anywhere from a few days to a few thousand miles. In the past, failures of the rubber mount have proved uneventful, but this time the suddenly-free exhaust pipe flew off the car. It didn't fly off all at once. The pipe had to bend back and forth a few times before it broke, and we made it almost all the way home by holding onto the semi-fractured exhaust pipe by the heat shield with our gloved left hand. When the pipe finally let go, we stuffed the muffler in the passenger seat and drove the last few miles with a very light throttle. Now that we now know what an open exhaust sounds like, any opinions we might have held previously about the Locost's loud exhaust are hereby null and void. 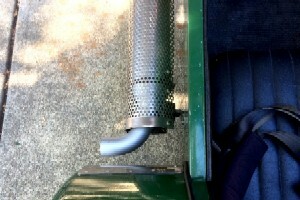 It turns out that our muffler, tiny as it is, has been doing an amazing job. Our first thought when the pipe came loose was that one of our welds had cracked. But no. The pipe broke just north of the weld connecting the Y-section tubing to the rear pipe, obviously a weak spot in the system, likely one of many. Our next thought was to weld the pipe back together at the break, although we weren't sure we could do that with the pipe on the car, and removing the exhaust sounded like a lot of work. So we tried the simple solution first, clamping on a sleeve, which did the trick but looked terrible, and also looked like it probably wouldn't last very long. Which proved to be the case the next day when we drove the Locost up to Sacramento. The muffler stayed on the car, and never gave any indication it was in any sort of jeopardy, but the weight of the exhaust tip rotated the pipe until it was almost dragging on the ground. We chalked this up to not enough torque on the clamp nuts, and maybe some heat expansion of the clamps, since all the nuts were loose and we could rotate the pipe by hand. So we torqued the nuts again, and this time they seemed to get the message, but then a few days later the exhaust tip was drooping again. So we decided that maybe it wouldn't be that hard after all to break out the welder, tack the sleeve to the pipes, and then remove the exhaust system to fully weld the sleeve in place. This would also give us a chance to repaint the thing, cleaning up some bits that have started looking a little crusty over the years. 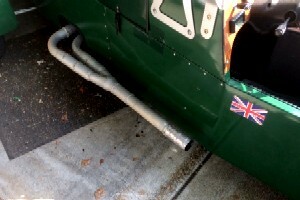 But if we were going do all of that, we'd have to decide whether or not to replace our tiny muffler with the big one that's been gathering dust in the garage for the last two years, and also decide whether or not to incorporate a new hanger design. With the ultimate reliability of our exhaust system now in question, incorporating a new hanger design sounded like a no-brainer. Unfortunately, coming up with a new design for a hanger was a brainer, since we wanted one that would use a standard rubber exhaust donut, and also the existing mounting holes on the side of the car. An extensive search through hundreds of exhaust hangers at Summit Racing was little help, but we didn't get our Locost built without blundering into a few engineering successes along the way, and we had every expectation we could do the same thing here. Especially since accuracy wasn't critical. The broken tailpipe was now sleeved, so we could adjust the overall length of the exhaust and weld the sleeve in place after welding on the new hanger parts. So we bought two steel exhaust pegs from Summit for peanuts, plus shipping, welded one on the muffler using the existing hanger gusset, and the other to the steel bracket that bolts to the side of the car. 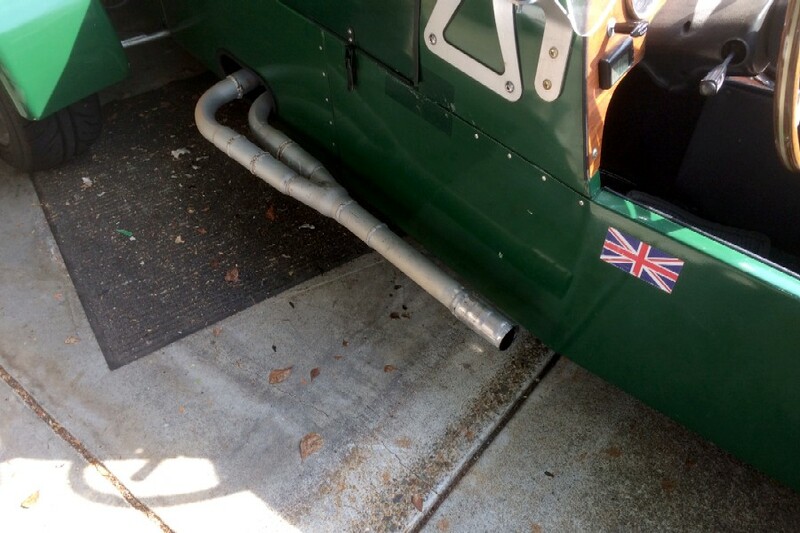 We then squeezed a rubber hanger around each peg, and the exhaust just hung there, perfectly. How long it'll hang there is specula­tive at best, but it's looking good so far. And the new hanger has some give to it, which is encouraging. 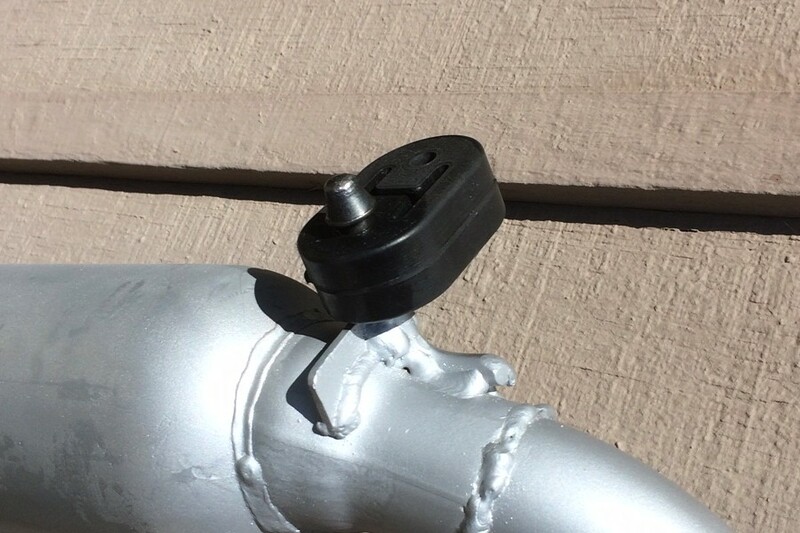 The tailpipe expands about 3/16" when it's hot, apparently over the limit for the old mounts, despite buying the most expensive rubber isolators McMaster-Carr has to offer. 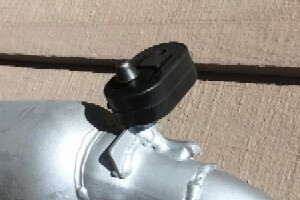 The new mount just swings to accommodate the expansion, no stress on anything. Of course the new mount is also free to swing over bumps, which is a little more worrisome, but we're pretty sure the same thing happens on real cars without putting too much stress on the exhaust. Although real cars don't bump quite like the Locost does. Since we already had the welder out, we took the additional step of welding on a new exhaust tip. 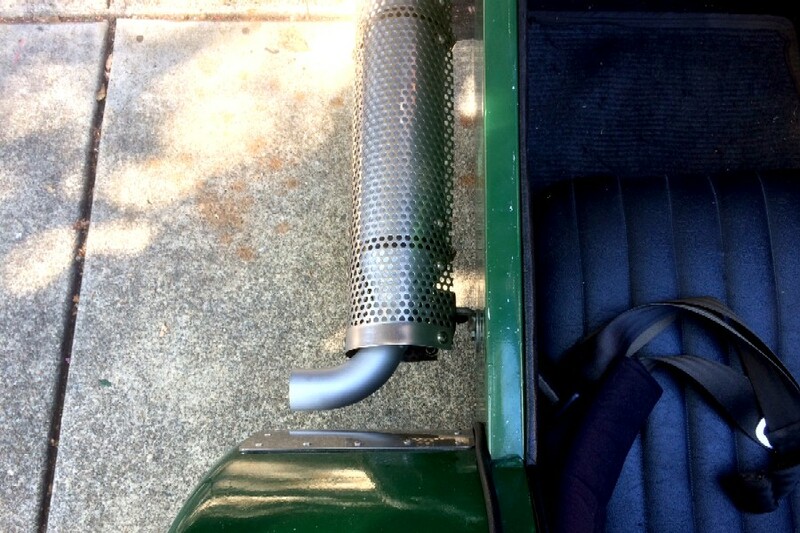 Long-time readers may recall that we experimented a couple of years ago with an add-on muffler, an experiment that failed after a few days when the muffler fell off on the freeway. That muffler was a SuperTrapp, invented by UC Davis college professor Paul Moller, who later went on to develop the Moller M400, a flying car that never saw the light of production but was featured in the Clive Cussler novel Atlantis Found, where it seemed to perform well, at least on paper. Unfortunately, Moller's muffler did not fare as well as the M400, and when it fell off the car we were left with just a stub of a tailpipe. We fixed it back then by bolting on a short chrome tip from O'Reilly Auto Parts, which looked only slightly ghetto and never fell off the car, although we were always unhappy with the way it changed the exhaust note, and the fact that it always needed polishing. The new tip looks way better, just like the original, and it's painted so polishing is not an option. Also, the exhaust sounds a lot better now. Although not quieter. Which is because the big muffler we bought two years ago is still gathering dust in the garage. But the big muffler has problems, not the least of which is having no ends. 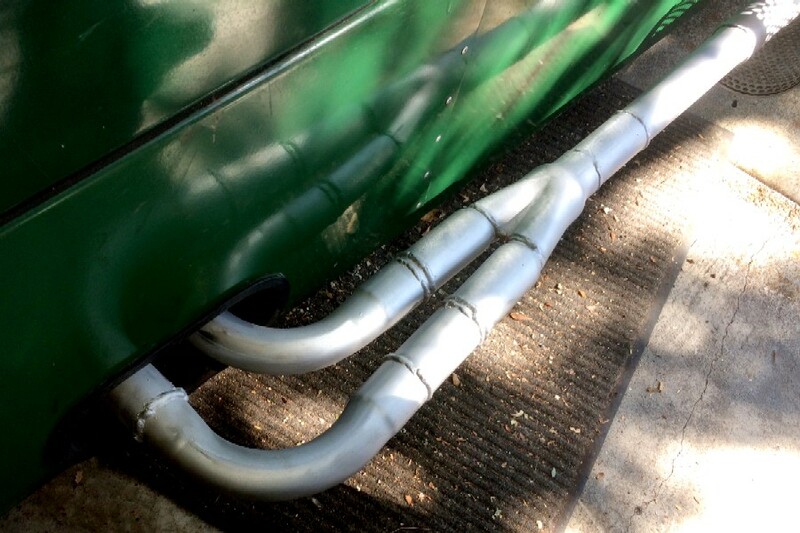 To make it work, we'd need to weld pipes to each end of the muffler, and it doesn't have any. Just giant holes. We knew this when we bought it, but somehow thought we'd figure something out. And we may yet someday, but so far nada. The good news is, we have a whole new respect for the sound-deadening qualities of our tiny muffler, and we know it fits. The big muffler might fit too, but we're not sure. Of course, like all our previous Locost engineering efforts, the new hanger has clearance issues, because that's just how we roll. During normal driving the hanger pegs maintain a slight air gap, maybe .02", but at idle the exhaust wiggles and the gap varies in rhythm with the engine, sounding somewhat like a metal woodpecker. Which I guess would be a metalpecker. 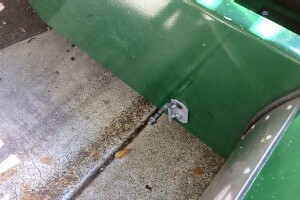 It looks like we can grind away a significant portion of the offending metal without compromising structural integrity, although that will require removal of the exhaust pipe again, so don't expect it to happen anytime soon. Aside from that, the new hanger works brilliantly, and looks like it'll last forever. So the Locost is back on the road, looking sharp with its freshly-painted exhaust and no unsightly muffler clamps. The whole job turned out to be a little more work than we had anticipated, but only took the car off the road for a day and a half, most of that spent waiting for the paint to dry, as usual. Despite the years of heat and rust, the nuts and bolts came off easily, i.e. without drastic measures, and we got a chance, while we had all of the seats and vinyl panels off the car, to do some cleaning. We're not considering this job to be any sort of repair work, because fixing the broken tailpipe turned out to be small potatoes compared to the benefits of replacing our flaky chrome exhaust tip, upgrading to a modern muffler hanger, and repainting the whole thing with VHT aluminum header paint, all regular maintenance items that we would've wanted to do anyway, given the chance. We also got to refresh our welding skills, which need refreshing from time to time, so in the overall scheme of Locost reliability, this actually turned out to be a productive breakdown. 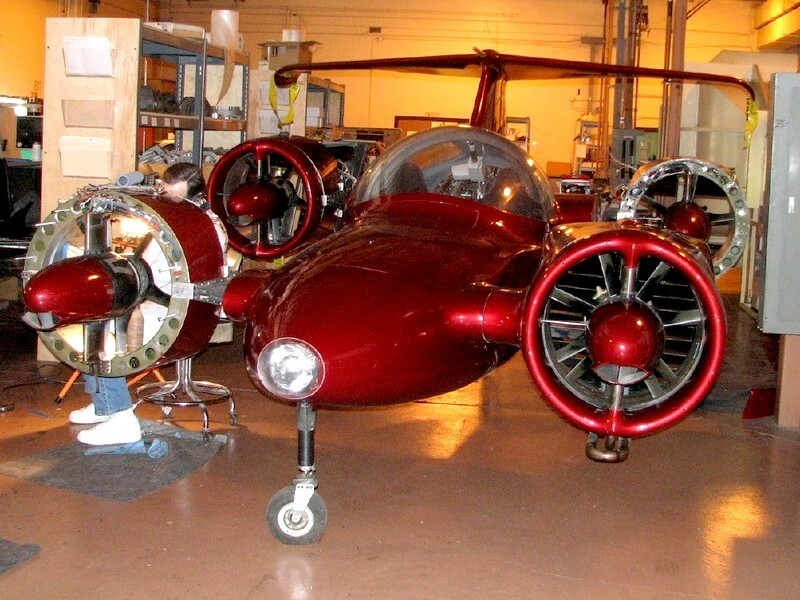 In the meantime we're thinking now about building a Moller SkyCar as our next project, assuming we can figure out a realistic budget, a proper donor, and some way to fit the sleek SkyCar body onto a Locost space frame chassis. We think it's possible, although we've been wrong about this sort of thing in the past, and not just a few times. Still, it would be a cool project. 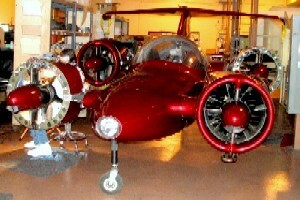 If we did build it, our SkyCar would look similar to the picture shown above, but would of course be green. And wouldn't be quite as big. And wouldn't actually fly.